In this study, the motion of a high speed container ship traveling in head seas was calculated using linear analysis. The results were used to animate a VRML model consisting of three object groups: Wave surface, ship hull with superstructure, and bending moment indicator displayed as a background graph. The application demonstrates the capabilities of VRML 2.0 for the correct visualization of engineering analysis results. Control buttons on top of the graph allow for interactive control of the VRML animation. 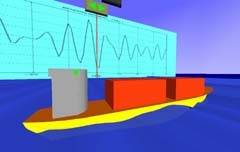 As the ship travels through the waves, a moving red line on the background graph indicates the current bending moment. The user can activate several pre-defined viewpoints (e.g., a viewpoint attached to the ship) or can freely navigate around the environment. Load the VRML 2.0 animation (175K compressed) and control the animation by operating the buttons. 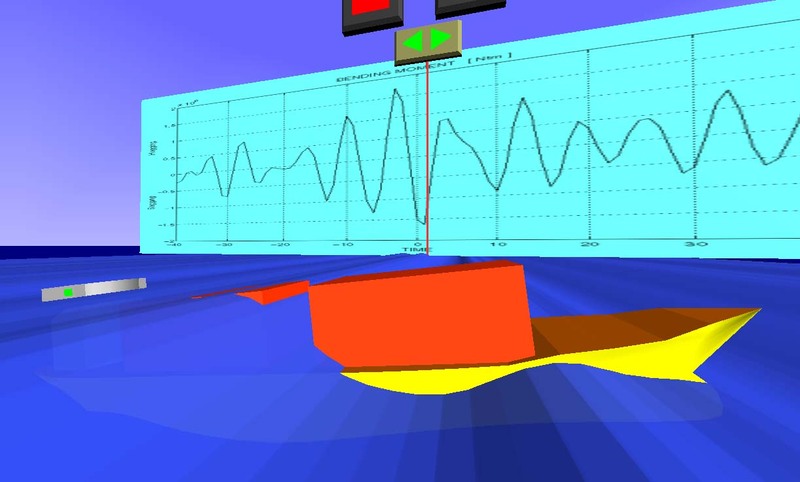 This application of virtual reality illustrates a methodology by which design hydrodynamic loads may be computed. The analysis is based upon the hypothesis that the environment or series of waves which excite the extreme linear response will also be similar to the wave train, or environment that excites the extreme nonlinear response. Once a desired design process is identified, (in the example shown here, the design process is the midship bending moment), the environment leading to the design values are determined such that the probabilistic design value is realized in a given, relatively short period of time (i.e., several wave encounters). The wave components and rigid body initial conditions, based upon linear analysis, can then be used in nonlinear time domain, sea keeping codes. The eventual result of the method will be time histories of pressures and local loads which can be incorporated into a Design Loads Generator (DLG) for subsequent ship structural analysis by Finite Element (FEM) codes. The goal is to generate many short time histories of the incident waves (on the order of four to ten wave encounters) which produce an ensemble of maximum nonlinear responses with desired statistical properties. 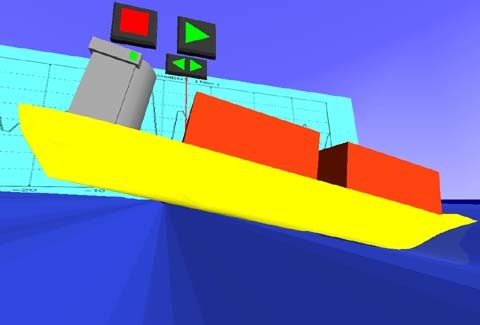 The utility of the approach is that the efficiency of the nonlinear seakeeping simulator is greatly enhanced through reduced run time. Zero Crossing Period 12 sec. The bending moment is displayed on the graph in the background. The wave train shown in the figures produce a moment that has a probability of exceedence of O(10-9). The limitations of linear theory are apparent in that the vessel's afterbody can come completely out of the water. The utility of the VRML animation is that the designer can see what the wave field and the vessel are doing at the time when the maximum bending moment is realized. Acknowledgment for partial support of this work is given to the American Bureau of Shipping. The VRML animation was created at the Department of Naval Architecture and Marine Engineering by graduate student Ibrahim Riza Adanir and by international interns Bert Schoenwaelder and Lars Schumann. The project was supervised by Professor Armin Troesch and Klaus-Peter Beier.